Just who is Ian R. Crane and why does he, together with the Gulf Coast Barefoot Doctors, persist in destroying the Gulf Oil Spill citizens’ movement? Why does a Britisher suddenly appear on the scene of the greatest environmental catastrophe in US history hawking his wares and conspiracies? 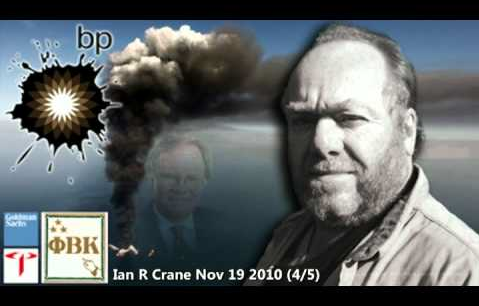 After many months of investigation of this British citizen – Ian R. Crane – we can report the following facts about his business, his mission and his “journalistic” practice where it concerns the BP oil spill in the Gulf of Mexico (GOM). It is very important to note that this foreign ‘journalist’ lives in the United Kingdom not too far from London, admits to being an ex-Shlumberger oilman, and makes his money from selling internet conspiracy theory (which may be true or false) about the Gulf oil spill. The point is that this is how he earns his income, by selling videos that purport to explain away all things related to the Gulf of Mexico Oil Spill. The first question anyone would ask is: Why was Ian Crane illegally and secretly taping a member – the National Coordinator no less – of the Gulf Oil Spill Remediation Conference? What was his purpose? In light of all the hacking and illegal behavior during the News of the World scandal in London, we now know that many journalists commit illegal actions as a matter of job performance. That doesn’t make it right, or ethical, or appropriate in any way. It just goes to show the rest of the world how far such a profession has strayed from legal conduct. Of course, in this instance the question remains why Crane felt compelled to conduct illegal taping of a telephone conversation? Who is he really working for? During the course of researching this whole affair, it became quite evident that Crane does work very closely with members of the Gulf Coast Barefoot Doctors (GCBD) group in NOLA. He and Deborah Dupre, a GCBD founder and ex-board member, have apparently teamed up to character assassinate anyone who disagrees with them or their modus operandi. Cross their path in any serious way and many agree you’re toast as far as personal destruction on the internet is concerned. Deborah Dupre has admitted that she and her family are paid by oil companies to transport oil through pipelines which they have permitted (contracted) to run across their properties in Louisiana. Dupre also writes for Examiner.com, an internet news platform which is staffed by citizen writers, all of whom are paid according to the size of their readership. Examiner.com has a very close partnership with Thomson Reuters, the huge media conglomerate headquartered across the street from BP International Headquarters in London. Wait, this gets more interesting by the paragraph! Just who are the Gulf Coast Barefoot Doctors and what is their MO? Please read the following article to fully understand the damage that this organization has wrought throughout the GOM coastline advocacy groups and beyond. Who are the Gulf Coast Barefoot Doctors? So, here’s the context: We have hundreds of real citizen advocates who live all over the Gulf of Mexico coastline, and who have worked since April of 2010 to bring into the public domain whatever they could contribute toward addressing the Gulf oil spill. They come from all different walks of life, both professionals and laypeople, and their shared passion and advocacy is assisting the rehabilitation of the GOM and its coastal environment. After 9 months into the Gulf oil spill, here comes Ian R. Crane bullying his way into the GOM advocacy network. Apparently he was not receiving enough publicity for his many conspiratorial narratives concerning the spill. He has lots of videos for sale and he’s not selling many of them; he just doesn’t get any traction. So, what does he do? He starts committing character assassinations on some of the most effective heroes of the Gulf Oil Spill to get the attention he seeks. And, then, he starts to get the attention (advertising) he obviously craves to jumpstart his oil spill business. So now he thinks he’s hit on a winning formula by bashing the heroes to get attention. Whose characters does he defame? People who have not only sacrificed their livelihoods, but in some instances their very lives. These individuals have spent their own money, time and energy with no compensation, reimbursement or donations and have put themselves in harm’s way to reveal the truths around the oil spill. And this is how Ian R. Crane treats them! A businessman from outside of London brings his own wrecking ball to the Gulf after it’s been destroyed by BP et al. Why does Ian R. Crane conduct such an unconscionable smear campaign? Why would he persist, after months of being told the facts, in defaming the characters of those who worked tirelessly to reveal the truth about the greatest environmental disaster in North American history? He’s not even from the USA and yet he makes money off of our tragedy and ruins the reputations of some of our best and brightest. Why? This entire site is basically dedicated to one of Crane’s current life missions. For all intents and purposes Crane would have us all believe that Robert Kaluza, “one of BP’s company men on the deepwater Horizon when it exploded”, is responsible for the whole Gulf oil spill. If you were to closely peruse his facebook page you will quickly see how many times Crane pitches his videos, dvds and other items for sale to the reader. 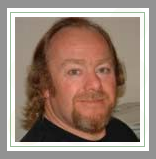 This site is really about one thing, and one thing only: Ian Crane selling Ian Crane’s products, and sometimes at the expense of very good, hard-working advocates. For the uninitiated it is very important to understand that the Gulf Oil Spill is the result of countless individuals, companies, politicians, regulators, contractors, sub-contractors, citizens, Big Oil employees, Military-Industrial Complex corporations, the US Federal Government, various state governments, etc., who either didn’t do their jobs or did them so well that this oil spill was just about guaranteed to happen. To lay the blame at the feet of one man – Robert Kaluza – or to even insinuate that he is the lynchpin (smoking gun) in such an investigation is simply ridiculous, which is just one reason why so many throughout the GOM advocacy network are profoundly offended by Crane’s dishonesty and disingenuousness. Please understand that we are not suggesting that Robert Kaluza did not play a significant part in the lead-up to the explosion, burning and sinking of the Deepwater Horizon. Only the evidence and proven facts can determine exactly what his role was in this very serious and consequential episode. However, many feel Crane can no longer be trusted to ferret out the truth because of his unlawful and self-interested behavior in related matters. Even if Crane were to lay the blame at the feet of an entire company like BP (whose actual responsibility is obvious historical fact by now and whose true criminal culpability may very well bankrupt it), his narrative would fall far short of the mark of truth. Many of us have come to realize that when anyone pushes a story with such obvious shortcomings, there is usually an agenda. We do know from talking to many who have read Crane’s comments and websites that he is well known for bashing those who receive more attention and publicity than himself. The real environmental advocate cares not about how much publicity he receives because his intentions are honorable and he seeks no monetary gain or fame from his activism. Can we say the same about an Englishman who comes into our neck of the woods and foists his theories, and products, and libelous statements into our faces? Just what is their MO? The GCBD simply label anyone who has fallen out with them an infiltrator. Disagree with them, don’t promote them, try to break away from their influence and you are suddenly called a BP agent, COINTELPRO, psyop or some other such pejorative label. As for Ian Crane, his favorite way of smearing anyone who he targets is to falsely accuse them of being part of the controlled opposition. Not a very nice thing to do to lifelong environmental activists whose very lives depend on the trust and good will that has been built over a lifetime. He is given to doing this so casually that he seems to be arrogantly unaware of the consequences of his actions. Actions which are essentially criminal as we have seen with the News of the World hacking scandal. As for the damage that has been inflicted on the entire Gulf of Mexico Advocacy Network, one can only imagine what will occur when highly influential and brutally honest advocates are taken down by such scurrilous and fallacious writing. When this occurred earlier this year, one could see the many volunteer advocates flee from the scene of this Crane/Dupre crime spree so as not to be tainted by their scandalous writing. No one wants to be tarred with the black and oily brush of the false accusation of betrayal. What would anyone do when the most vocal and authoritative Gulf advocates are taken out with one slice of the slanderous blade? So quickly and easily! These two perpetrators sowed the seeds of fear and alarm so deeply that most of these folks will never come back to their respective health advocacies and environmental groups. Others have strongly expressed an aversion to working with any environmental health advocacy groups in the foreseeable future. Even more tragic, the libelous articles and comments disseminated by both Crane and Dupre have planted so many seeds of mistrust that, where many worked together in a collegial relationship, these quickly dissolved into distrustful interactions. Mutual suspicion now replaced what was mutual trust throughout many of the key groups, which were making real headway with various Gulf restoration projects. This investigative journalist has spoken to many Gulf residents, enviro groups and citizens throughout the Southeast during the past year and heard many stories about several different aspects of the BP Gulf oil spill. Clearly, the writings of Ian R. Crane and Deborah Dupre have done more to undermine a vibrant citizens’ movement than all the other mainstream media disinformation taken together. After viewing numerous emails from different individuals formerly associated with the GCBD, it became clear that it was the most destructive enterprise on the Gulf. So many good people were defamed and humiliated that the word started to spread like wildfire. Unfortunately for Ian Crane, he chose to throw fuel on the fire, when he could have worked to put it out. True intentions do become known quite quickly under conditions of duress like the Gulf oil spill. Many of those concerned have remarked that a fraud is very easy to spot when the situation is as desperate as it has been during this awesomely tragic oil spill. Please be aware that Ian R. Crane is now under very serious investigation for the same criminal behavior as Deborah Dupre. According to those who have been injured by Ian Crane’s actions, he is being taken up on his challenge shown above. We will end this expose with a note of appreciation for the many Gulf advocates who have literally died in the line of duty. Some who have not been killed have continued to perform their work under death threat; others have literally been the object of attempted murder and assault. Through the despicable actions and writings of both Ian R. Crane and Deborah Dupre these same individuals have now incurred an additional risk. Their lives have been put into even greater jeopardy and their characters thoroughly defamed through false and malicious statements they continue to post on the internet.